Bandcamp Subscription Primer – Your Questions Answered! Right, as you no doubt no by now, the Bandcamp artist subscription service has become my primary way of making music available. I’ve had the subscription for 3 years, and in that time have released more music than in the previous 15 years combined. None of it has been ‘demos’ or bootlegs – I just have a music life that results in an awful lot of finished albums. The history of music is littered with great records that were recorded in a single session, live off the floor, and that’s how all my music is made, whether solo or collaborative – and because of the way I’ve built my live rig (after 15 years of tweaking/upgrading/refining), I can get a studio quality multitrack recording of every gig. If I was in a band that played the same set each night, that would result in a single live album, edited from the best bits of the tour, once a year or so. But because I improvise, every gig is potentially an album – and I tend to choose fabulous people to play with, so that ups the likelihood that it’s going to end up being released. The subscription is NOT renting the music. Streaming services like Spotify charge you a monthly service to be able to stream their music. If you stop paying, you lose access to the premium aspects of the service, and if you close your account, you lose all the playlists and information that you’ve curated. With my subscription, you own the music – you can download it all in whatever format you like, and it’s yours for ever. If you lose it (stolen phone, crashed hard drive) you can download it all again from Bandcamp without paying any more money, whether or not you’re still a subscriber. YOU OWN IT. Bandcamp is, however, also a streaming service. The Bandcamp app gives you access to everything you’ve bought in Bandcamp, and acts as an amazing discovery service too – you can search the whole of Bandcamp via the app, and listen to albums that way, and you get a feed of everything that the people whose fan accounts you follow are buying. So if you follow people with excellent taste, there’s a ready-made recommendation engine there. So when you’re out and about, you don’t have to download all 30 albums (or however many it is now!) to your computer and copy all of that over to your phone – you can just stream it direct from the app, and pick and choose from any of the subscriber music, without the need to pre-plan it. But you can also download the same music in multiple formats – so, if you want a lossless version for your computer at home, but the MP3 for your phone (to save on data by not streaming) that’s all good – you can get both versions. Like I said, it’s yours. The main purpose of the subscription is to make more music possible. The main focus of the mainstream recording industry is not, in case you were wondering, promoting and selling brand new music. The massive value in their model is in re-selling you access to things you already love. That’s why Spotify works for them – to a large extent, people are paying again to stream music they already own and love. Spotify is a convenience, that has new music thrown in too. But it makes way more sense if your album sold 10 million copies 25 years ago than it does if you’re trying to recoup on a brand new album, without all of that historic investment in your music. 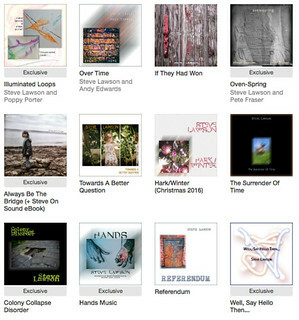 Here, my back catalogue is offered to you as part of the subscription so you can catch up. There’s some amazing music in there – I’m deeply proud of all if it, and the journey that it charts through the last couple of decades – but the exciting stuff is what’s still to come. 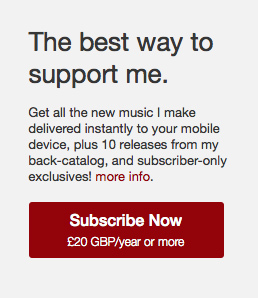 The £20 a year is to make that possible, not to try and squeeze additional money out of music that already exists. I’m less interested in creating ‘passive income’ than I am in making it viable to perform, record and release new music that moves this story forward. So your £20 a year is what makes that possible. It’s also OK to unsub and immediately resubscribe in order to change the amount you’re paying. Some people put in an amount much bigger than the minimum £20 when they first sign up. Lots of those people are happy to keep paying that amount. But if you get to the end of the first year, and want to move back to the £20 minimum going forward, it’s easy enough to unsubscribe and resubscribe at the lower rate. Likewise (and even more wonderfully!) it’s possible to do the opposite – to unsub and resubscribe at a higher rate, if the value proposition is one that you think is worth more than the minimum you paid in the first year. I don’t currently have a plan B. This is the best possible way I’ve come across for me to keep the music making viable. To be able to collaborate as widely as I do, to do proper, careful, beautiful mixes and mastering on every one of these recordings takes a lot of time, and I just wouldn’t be able to do it if I was sticking half of it up on Soundcloud or YouTube or even releasing it to iTunes etc… The ongoing funding model here means that you’re not having to pay £8 for every album that comes out, and I’m not having to spend thousands marketing this stuff to an audience that need convincing of the value of each individual album. I love you all. I really do. The subscribers, past, present and future, are the people who make my music life possible, who create a world where other artists can look at what’s going on here and see a different, new way to make their music, to not get lost in a system where you’re supposed to spend ten grand on a record and twenty grand marketing it and then tour the same 10 songs for a year while filling your YouTube channel with twee covers in the hope that people will hear them and want to buy your album. Nope, there’s a better way – there’s deeper magic to be had, that means we still get to support niche art, art that’s made without an eye on the charts, that’s not beholden to a record label’s promotional schedule, but which results in some amazing music that helps us soundtrack and make sense of this rapidly changing world.